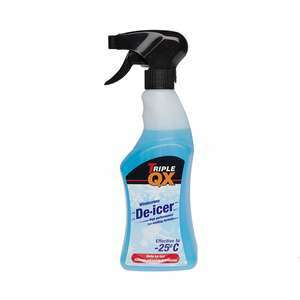 Triple QX De-Icer is a high quality, concentrated formula. Designed to be used with a trigger and not an aerosol, means less waste, and better value for money. Never used deicer for the last 25 years of driving, Luke warm water and frost and ice is gone in seconds. No need to use chemicals. I use warm water for most occasions we have a light frost on the windscreen. But I usually keep a trigger bottle full of the Lidl Ultimate speed winter screen wash at hand just in case. It's rated at -60 degrees Celsius and cost £5 for 5lt. Just have to wait and see if they are doing it again this year. Never used deicer for the last 25 years of driving, Luke warm water and …Never used deicer for the last 25 years of driving, Luke warm water and frost and ice is gone in seconds. No need to use chemicals. Is this cover any good? It's only £1.53 so worth a go but that one is from China, you'll be using it as a sun shade instead by the time it arrives. It's cheap. I always use warm water at home, I have heated windscreens and leave the wipers on. Deiced in 30 seconds. Only in the most extreme conditions would it not be enough and refreeze again. However if the car was frozen over and I wasn't near an easy source of warm water........plenty of times in the winter I face those circumstances. Mostly car parks. So I always keep a couple bottles of half decent deicer in the boot. Its not the outside, which is easy to defrost, its on the inside! This product is rubbish. Used at minus 4 one morning, didn't melt small covering of ice. It's only £1.53 so worth a go but that one is from China, you'll be using …It's only £1.53 so worth a go but that one is from China, you'll be using it as a sun shade instead by the time it arrives.